Departure from Bedouin Lodge at 08.00 am – 1-hour drive to the White Canyon – Climbing through the Canyon for about 1½ hours with our Bedouin guide till we reach the Oasis of Ain Khudra. Taking lunch in the Bedouin tent. Having time to relax, chat with the Bedouins & drink tea with them. Possibility to swim in the pool. Driving on by Jeep to the Mushroom Rock, and than to Jebal El Makharoom. Finally we drive to the nearby sand dune El Hadudah. After a breathtaking marsh down the huge dune through soft sand, our Jeep will await us to return back to Dahab. *There is the possibility to walk through the Closed Canyon or Arada Canyon instead of the White Canyon. Departure from Bedouin Lodge at 08.00 am – 2-hours drive to the Colored Canyon – Walking through the Canyon for about 1½ hours with our Bedouin guide. After:1-hour drive to the Oasis of Ain Khudra. Taking lunch in the Bedouin tent. Having time to relax, chat with the Bedouins & drink tea with them. Possibility to swim in the pool. From the Oasis we start our walk into the White Canyon for about another 1 ½ hours to climb through it. At the end of the Canyon our Jeep awaits us to return back to Dahab. *This trip could be done as ½-day-trip as well, by visiting one of the Canyons only and the Oasis of Ain Khudra. *There is the possibility to walk through the Closed Canyon instead of the White Canyon. Departure from Bedouin Lodge at 08.00 am – 1-hour drive to the Arada Canyon – Walking through the Canyon for about 1½ hours with our Bedouin guide. After:1-hour drive to the Oasis of Ain Khudra. Taking lunch in the Bedouin tent. having time to relax, chat with the Bedouins & drink tea with them. Possibility to swim in the pool. From the Oasis we start our walk into the White Canyon for about another 1 ½ hours to climb through it. At the end of the Canyon our Jeep awaits us to return back to Dahab. *This trip could be done as ½-day-trip as well, by visiting only one of the Canyons and the Oasis of Ain Khudra. *There is the possibility to walk through the Closed Canyon instead of the White Canyon. Departure from Bedouin Lodge at 08.00 am – 1-hour drive to Bir el Safra. Enjoying the fresh waters of the well before we continue our drive to Jebel el Makharoom. From there, drive to the huge sand dune El Hadudeh. Enjoying the soft white sand, before we depart to the White Canyon by Jeep. 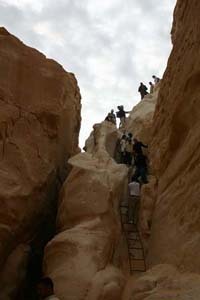 Climbing through the Canyon for about 1½ hours with our Bedouin guide till we reach the Oasis of Ain Khudra. Taking lunch in the Bedouin tent. Having time to relax, chat with the Bedouins & drink tea with them. Possibility to swim in the pool. Finally departure back to Dahab. 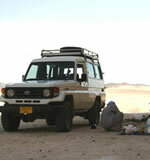 Departure from Bedouin Lodge at 08.00 am – about 1½ -hour drive t o the Protected Area of St. Catherine. Visiting the monastery from inside & the monk’s gardens from 10.00 till 12.00. After: Driving to the Oasis of Ain Khudra. Taking lunch in the Bedouin tent. Having time to relax, chat with the Bedouins & drink tea with them. Possibility to swim in the pool. From the Oasis we start our walk into the White Canyon for about 1 ½ hours to climb through it. At the end of the Canyon our Jeep awaits us to return back to Dahab. 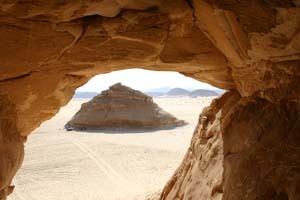 *There is the possibility to visit the huge sand dune El Hadudeh instead of the White Canyon and the Oasis. *There is the possibility to visit the Closed Canyon or the Double Canyon instead of the White Canyon and the Oasis. Departure from Bedouin Lodge at 08.00 am – about 2-hours drive to the Oasis of Ain El Kid. Walking about 1 hour through the Oasis with our Bedouin guide. Drinking tea in the Oasis with a Bedouin family. Having time to relax, chat with the Bedouins. After: about 1½ hours drive by Jeep to reach the Protected Area of Nabq. Taking lunch directly at the beach – prepared on the fire by the Bedouins. The Nabq area is rich of flora & fauna. We will visit the Mangrove forests, watch some different kind of birds, visit the Bedouin village of the fisherman El Hurghana, etc.! Optional time for snorkeling / swimming in one of the lagoons. Finally about 1½ hours drive to return back to Dahab. 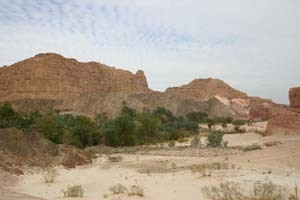 Departure from Bedouin Lodge at 08.00 am – about 1½ -hour drive to reach the National Park of Ras Mohamed. First we go to the main beach for a breathtaking snorkeling. Than visiting the Mangrove Channel and explore the Hidden Bay. Time for lunch in Yolanda Bay. Possibility to do snorkeling here again, or optional at Shark’s Reef. Please be aware that the underwater world of Ras Mohamed is unique and rich of fish and different species!!!!! In the afternoon we make it back to Dahab. *Upon request we can visit Naama Bay or the Old Market of Sharm El Sheikh on our way Back to Dahab.